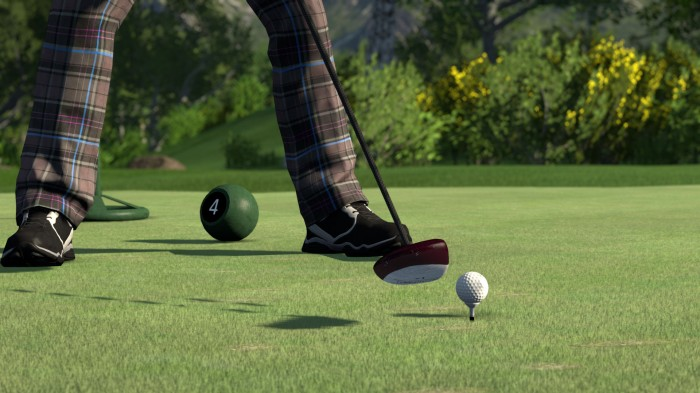 The Golf Club is looking better and better, with Early Access on Steam and future release plans on the home consoles. It looks gorgeous, has a spectacular pedigree and should be an excellent game. It’s been a very busy few months here with press tours, GDC, E3, improving the build weekly with the feedback we’re getting from the community all while trying to finish the game for the full release. From the Forum posts, Tweets, Facebook posts and private emails we’re receiving we know that everyone is desperate for us to announce a console release date and to finish the game so they can get it in their hands. Thus, we thought we’d give you a quick update of how things currently stand. I think we’re all pretty happy with the gameplay now. The game is very easy to pick up and play but difficult enough that any high scores on medium difficulty courses and above are realistic meaning that people are feeling challenged when they play and there is a course out there for all skill levels. That balance is important to keep. We’re seeing some amazing courses being made with the Course Creator by The Golf Club Members. It is extremely rewarding to see how easily people can pick it up and create something and how those creations are getting critiqued by the community. As the days go by the creations becomes more and more impressive with The Secret of Giza being my personal favourite from the last couple of weeks. Over the last few months we’ve finalised all the features of the game that we are shipping with the full release. We’ve still got a huge list of things we want to do but we have to draw the line somewhere. Currently we’ve got a great golf game with a rich set of features and a really solid foundation for future community driven development, which is hugely exciting. With the game in a place we’re happy with, feature and gameplay wise, it’s been time to turn our attention fully to polish and bug fixes plus requirements for console development. There is always a huge push at the end of any project but with The Golf Club we’re desperate to get it in the hands of the console members so they can start playing and creating the courses their counterparts on PC have been enjoying for the last few months. As you can imagine, the console work isn’t a simple task and the majority of the team is dedicated just to that. First Party are also very strict about how games are structured, so we need to make sure we meet the intricate structural and technical requirements precisely. The remaining team members are working on bug fixing and translation work, again not a small task. We want to get this done as quickly as possible so we can get the game into the Microsoft and Sony approval processes and then onto the digital shelves. Unfortunately, it has meant that we’ve put the PC Early Access build updates on hold for the last couple of weeks while we concentrate on this. Whilst the majority of bug fixes benefit all builds, delivering a PC build externally takes a good bit of time for preparation and smoke testing to ensure there no critical issues have been introduced that break the experience. The build in Early Access at the moment is solid and losing any time from the console requirements would keep pushing back the submission and in turn the release date. So the good news from that is that we’re just about done. We’ve got a couple more days of work before we’re in a place to submit and once we’ve done that, and we get an idea of what Microsoft and Sony’s QA teams are having issues with, then we’ll be able to announce an exact release date. At the same time we will be refocusing on PC for further optimisation and compatibility work. Generally, it takes two submissions to get through the First Party approval process and then there is a waiting period before the game can appear in their stores. I know there’s some concern that, because we haven’t announced a release date, we must be months away from release but that isn’t the case. We just don’t want to announce a date and miss it. There are many moving parts in the finalling process and, unlike big publishers, we aren’t able to control some of those parts from a long way out. Now that submission to First Party is upon us we will be able to announce a precise date.